It’s just two days before Chanel’s Autumn/Winter 2015 women’s ready-to-wear collection is shown and Karl Lagerfeld sits at his desk, surrounded by 20-odd members of his inner circle – both personal and professional – putting the finishing touches to his always huge collection. The studio – where Gabrielle Coco Chanel once worked, at 31 Rue Cambon – is a jewellery box of a space, located immediately behind the famous staircase. Re-fitted under M Lagerfeld’s watchful eye two and a half years ago, it is all mirror and glass and sparkles with natural light. Still, given the status of the house in question, it is tiny: full of bustling life, unassuming energy and surprisingly informal – just how this extraordinary creator appears to like it. That M Lagerfeld eats, sleeps and dreams fashion is a given. Today alone he is expected to fit no less than 50 models. Anyone who has ever witnessed this process before will know that the immediate run up to a show is, more often than not, an intense and often tortuous affair. Not to so here. The relaxed atmosphere is unprecedented. Many of the most gifted technicians and feted hair and make-up artists, models and fashion commentators will pass by, all under the watchful eye of the world’s greatest couturier, but such grandeur is understated in a manner only the most confident know how. Lagerfeld may have the weight of the most successful name in fashion resting on his shoulders but the over-riding impression is that it would be nothing short of tasteless to communicate that fact. Instead, while everything is clearly focussed, it is also eased. To style Binx Walton’s looks with or without gloves. That is the question. "Just because I wear them doesn’t mean everyone else has to," M Lagerfeld quips. That’s a no then. He passes around a classic two-tone beige and black pump, just the kind that Chanel was once known for and its original maker used to wear. The same shoe will be worn with every outfit and that is a first. In fact: "In the 100 years since I’ve worked here, I’ve never done this shoe," Lagerfeld says. "The same shoe will be worn with every outfit and that is a first"
Lindsey Wixson has flu – it’s sweeping Paris at the moment – but you’d never know that, so pretty she looks in sugar-pink knit accessorised with ropes of pearls, another lovely house signature. Talk – inevitably – comes around to Choupette. She has been paid "a fortune" her proud owner says, for campaigns for Shu Uemura in Japan ("it was so successful they want to launch Choupette Uemura") and for Opel Corsa cars in Germany ("like Claudia Schiffer"). Both were shot by her owner who would never allow anyone else to capture her beloved image. "I put all the money into a special account so that if anything happens to me the person who takes care of her gets it all," Lagerfeld says. Like something out of an immaculately choreographed film, bang on cue, the designer’s godson, six-and-a-half year old Hudson Kroenig, steps into the room with his preternaturally handsome father, Brad Kroenig, and Karl Lagerfeld leaps to his feet and kisses him warmly. Hudson is introduced to and says hello to everyone – as well as looks he has great manners. 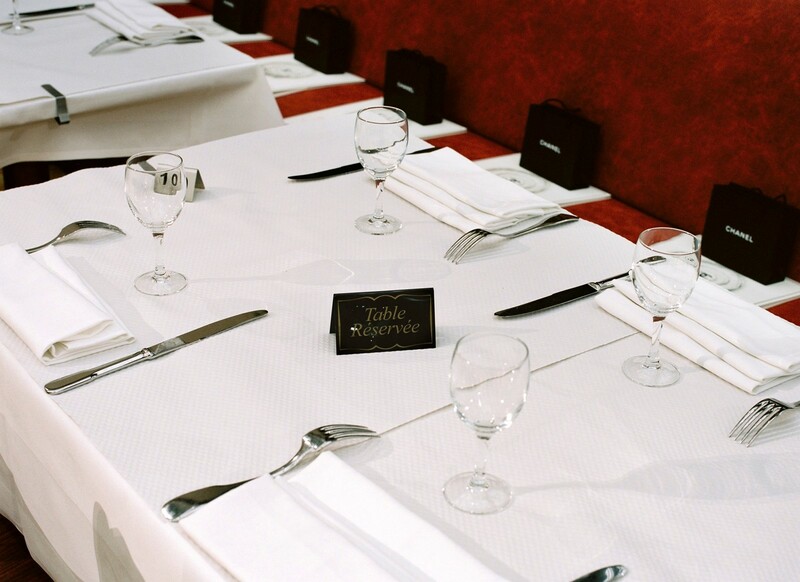 For the show, a quintessentially French moment with an entire Brasserie – Brasserie Gabrielle, of course – installed at the Grand Palais for the set, Hudson will sit at his own table and watch the proceedings with the rest of the audience. Karl Lagerfeld hands him a red toy Ferrari ("you will hold this under one arm") and a doll complete with frilled frock and black bob ("and this under the other"). The latter’s resemblance to Coco herself is clearly no coincidence and happy Hudson, who soon settles down to sketch next to his godfather, will be allowed to keep both.